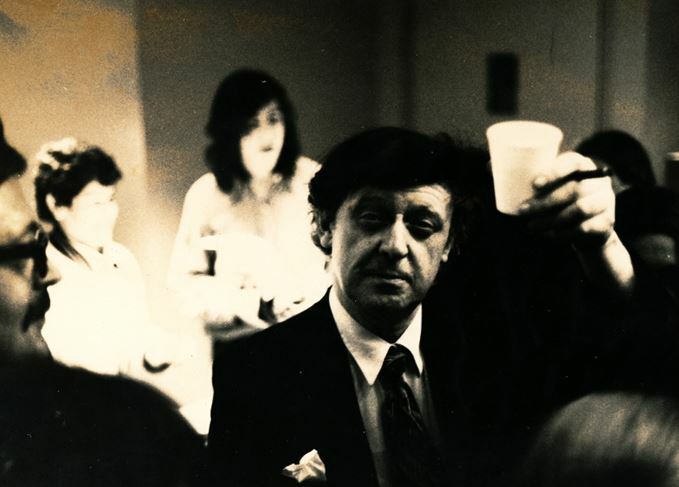 Anthony Burgess wrote 33 novels in his lifetime, including the celebrated A Clockwork Orange in 1962, and along the way collected a selection of hardy drinking partners, including Kingsley Amis, Graham Greene and William Burroughs. Prolifically creative, he even turned his hand to mixology, producing some rather potent cocktails. Iain Russell tells his story. Anthony Burgess (1917-1993) was a prolific English author and composer. He is best known for the 1962 novella A Clockwork Orange, which was adapted as a controversial film by director Stanley Kubrick in 1971. An enthusiastic drinker throughout his life, he was known to enjoy a glass or two of Scotch whisky. Born John Anthony Burgess Wilson, he served in the British Army during the Second World War and then became a teacher. In 1954, he moved to Malaya and later to Brunei, where he and his wife became notorious for their prodigious alcohol intake. One of his former colleagues told his biographer Andrew Biswell that Burgess was, latterly, drinking a bottle of whisky a day, although Burgess himself told interviewers that he and his wife drank mostly gin. When heavy drinking undermined his health, Burgess was invalided home to England, where he recovered and began to earn his living as a writer. In all, he wrote 33 novels and countless more books, newspaper articles and reviews. He was also a talented composer, and he became a frequent guest on late night talk shows in the UK and US, with a ready and erudite opinion on the great cultural and philosophical issues of the day. Whisky drinking is common in Burgess’ fiction, and most prominently in the story of A Clockwork Orange. The novella was written, Burgess told the impresario and Rolling Stones manager Andrew Loog Oldham, ‘in a writing frenzy, buoyed by Scotch, amphetamine and no sleep’ after he was diagnosed (he claimed) with cancer. It is set in a dystopian future, where 16-year-old Alex and his gang of sadistic teenage anti-heroes drink milk laced with drugs in preparation for their evenings spent indulging in ‘a bit of the old ultra-violence’. But on their visits to their local pub, The Duke of New York, Alex and his ‘droogs’ curry favour with some old ‘baboochkas’ and ensure ready alibis by treating them to rounds of double whiskies (referred to as ‘large Scotchmen’, or ‘double firegolds’). When Alex entices two young girls back to his flat, he treats them to, ‘a real horrorshow Scotchman apiece, though well filled with sneezy pins-and-needles soda.’ After plying them with a second round of highballs to get them thoroughly intoxicated, he subjects them to a callous and brutal sexual assault. In the story’s final chapter, controversially withdrawn from the original US editions, Alex’s final renunciation of his old violent ways is heralded by his refusal to join his henchmen in a round of Scotchmen at the Duke of New York – his request for a small beer is recognised as a sign that he no longer has the stomach for his former way of life. Burgess often drank with other famous writers of his day. He was a friend of the great whisky drinker Graham Greene, for example, before the two fell out, and of the American novelist William Burroughs, with whom he went on drinking sessions in London and Tangiers. He was also friendly with Sir Kingsley Amis, another prolific and bibulous English author. Amis devised some notoriously alcoholic and peculiar cocktails during his lifetime, sharing the recipes for such delights as Evelyn Waugh’s Noonday Reviver (a large gin mixed with Guinness and ginger beer) and the Polish Bison (hot Bovril, vodka, a shake of pepper and a dash lemon juice). After his wife succumbed to cirrhosis of the liver in 1968, Burgess married an Italian countess and, largely for tax reasons, moved to continental Europe. He wrote later that he became addicted to excessively strong tea (five teabags per mug!) when his fondness for alcohol diminished in later life, but there is no doubt that he remained fond of a ‘real’ drink. Mullen recalls that Burgess subsequently consumed three bottles of wine during the course of what was admittedly a lengthy conversation. America’s most loved singer had a colourful off-stage life, with Jack Daniel’s to the fore. Bill Murray’s jet-lagged and jaded movie star remains his most celebrated film role. Great Odin’s raven! To the original Anchorman, ‘Scotchy Scotch Scotch’ is kind of a big deal. Tintin’s most loyal companion loves a drop or two of Scotch – particularly Loch Lomond.